We’ve all heard about the benefits of meditation. It reduces stress, improves quality of sleep, and may just boost your immune system. 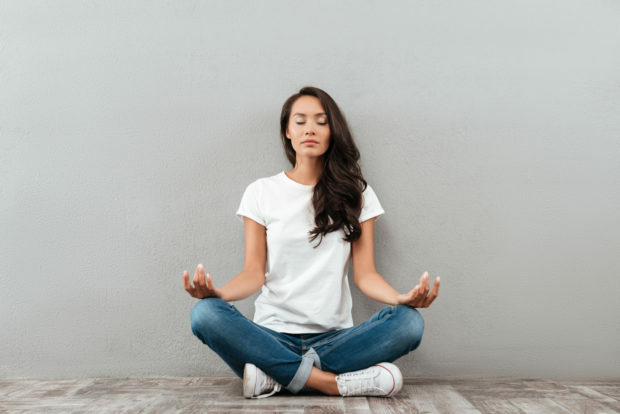 And while some meditation masters meditate for upwards of two hours a day, even just two minutes of daily mindfulness can improve your mood and your life! If you’re getting on the meditation train, here are some tips and tricks for making your meditation habit stick. There are plenty of meditation apps out there, but one particularly popular one is Stop, Breathe, and Think, which is available for Android and i-phones alike. The app has 34 meditations from which to choose. It also teaches you about the benefits of mindfulness, just in case you’re still on the fence. The app isn’t free, but it’s a very affordable $10 a month. To put things in perspective, that’s cheaper than a movie ticket! It’s a small price to pay for peace of mind. Music often helps us clear our heads. Youtube boasts thousands of free meditation tracks, some of which are more than three hours long. Whether you’re looking for tunes that claim to lift your serotonin levels or music that facilitates deeper sleep, Youtube has what you seek! You’ll never run out of soothing songs as long as you have a wifi connection! Relax, we’re not saying you have to buy overpriced tickets to the next Goop Summit. There are way more affordable ways to learn about meditation! Check out the websites of local community centres to see if they have any upcoming workshops on meditation. You would be surprised how many actually do! Workshops provide you with the opportunity to ask any burning meditation questions you might have. In addition, they also introduce you to a community of like-minded people who are also seeking calmer lives. Don’t be afraid to google free meditation workshops in your city! Meditation is a skill. In the twenty-first century, we’re all addicted to our screens. This means it may at first be hard to focus on mindfulness. That’s okay! You can start with as little as thirty seconds of meditation a day and work your way up! Remember, achieving mindfulness isn’t a sprint, it’s a marathon!